Monk's music, recorded live and in his prime. Thelonious Monk was one of the great eccentrics of jazz music. Beyond the funny hats, beyond his tendency to indiscriminately bash away at his piano, was the inimitable sense of melody and sophistication that went into his craft. Though prized for his ability at his instrument and his comping skills (largely being responsible for introducing such previously unusable things like the tritone and the minor second into the jazz lexicon), it was truly the material he contributed to the overall jazz canon that assured his place as one of the all-time greats. More than any other member of the bebop class (save perhaps Parker and Gillespie) his compositions moved the genre forward and are still a necessary step in the education of the modern jazz musician. Monk was also a respected luminary of the jazz world, as many musicians like Bud Powell and John Coltrane held residence in his band before going on to their own successes. Monk's style of playing has been called 'nearly impossible to imitate' with good reason. Simply put, the way he plays sounds, upon first listen, not only foreign but inherently wrong and offensively bad. Due to the conditioning of listeners' ears towards only hearing certain rhythms, certain harmonies and certain intervals, Monk's comping can be extremely jarring until the listener is finally clued into the fact that, yes, he is playing that way on purpose. He is more than capable of playing 'normally' if he so desires. Look to the example of "Nutty", the first track here. Monk starts off playing some haphazard jabs of atonality that almost completely mask the melody hiding underneath. The melody itself, which is rather lighthearted and even jaunty, doesn't become readily apparent until saxophonist Johnny Griffin joins him, and even then Monk keeps pounding away at a kind of chord structure that would fit much more comfortably within Schoenberg than with a mellow jazz quartet. Only when he takes a solo does it dawn on the first-time listener that despite his proclivities for sonic confrontation vis-a-vis dissonance, Monk possessed one of the best melodic sensibilities of any player of the past century. In stark contrast to the unabashed virtuosity of his peers, which, as the years went by, descended into nothing more than rapid-fire scale recitations, Monk tastefully interpolates the head of the piece throughout his solo with a sweetness and levity with occasional splashes of his forward-thinkingness in the form of slightly aloof intervals. The actual, physical way that Monk played had a lot to do with the timbre of his solos and comping; as opposed to curving his fingers and playing with the tips touching the keys, he played with his fingers outstretched and taut, striking the keys like he was an abusive parent disciplining a child, often using the strength of his entire arm to rain blows upon the instrument. As many people might not know, the piano is actually classified as a percussion instrument, like a drum. Monk's playing was a knowing attempt to approach the piano as a highly complicated drum, rather than as the kind of machine that birthed countless classical forms; a Beethoven sonata and a Monk composition could hardly be more diametrically opposed, but the fact that they can both spring from the same instrument is astounding. The overall feel of the album is extremely mellow, and tends to mostly shy away from some of the hyperactivity that is associated with bebop and hard bop. The one exception is the occasional forays into over-playing by Johnny Griffin. He takes solos on all the songs here (with the exception of Monk's languorous solo take on "Just A Gigolo"), but many of them are more or less running up and down scales. This style of playing is a tremendous hindrance to the compositions; on "Nutty" and "Blues Five Spot" the music almost stalls when his solo spots begin. On the former, particularly, this approach is extremely awkward and almost completely inappropriate. All of the countless Parker-isms in these solos serve to make Monk's solos look all the better. And the sad thing is that Griffin also had a good sense of melody, as shown in his extended solo for "Let's Cool One", which starts out reserved, dancing around laid-back sequential patterns and jumping up and down the instrument's range. However, he gives in more and more to the bad habit of playing with his brain rather than his soul as the piece goes on. Luckily, these tropes are mostly avoided in his playing on "In Walked Bud", which again shows that playing with more complexity and ferocity is not the same thing as playing with more passion and heart, but neither are the two approaches interdependent, as his faster passages here are tempered by a searching melodic design. Once the song goes into double-time and drummer Roy Haynes' manic yet grounded playing propels everyone else along, Griffin's manner noticeably improves. Even more adventurous in this piece is the playing of Monk himself, which pushing the song to the breaking point only for bassist Ahmed Abdul-Malik to break it completely within a solo that slowly, completely and fascinatingly disintegrates any pretense of structure, tonality and rhythm, leaving it up to Haynes to reassemble the song bit by bit before beckoning the entire band back to play the head and finish up the piece in sublime fashion. The title track is one of Monk's most easygoing compositions, and the entire band just eases right into it, stretching the song out to eleven minutes and just enjoying themselves with little self-expectation (maybe too much, as Monk himself takes a break for most of the piece). The best part is the juxtaposition within the rhythm section; Abdul-Malik is cool and chilled-out, only bothering to playing on the downbeat with the occasional eighth-note thrown in for good measure. Haynes, meanwhile, is like an impatient child in the backseat of a long car ride; he mostly sits still, but lets out intermittent jabs and screams, impatiently wanting more and getting nothing back for his efforts until finally resigning himself to just relaxing with everyone else. One of the genres of music that has benefitted most from technology has been jazz; only so much music could fit on a record, and whereas many rock bands struggled to come up with a worthwhile thirty to forty minutes to include on an LP, jazz bands actually has the opposite problem of having to decide what to leave out since they had far more material (quantitatively, and often qualitatively as well). So the advent of digital technology has done a good job of correcting this unfortunate issue. Now, older jazz albums can be reissued with all of the extra stuff tacked on. And unlike the worthless B-sides of rock groups who pad their reissues in order to jack up the price, the extras on jazz reissues are actually worthwhile. Take for instance the beautiful workout of "'Round Midnight", perhaps Monk's best known piece due to Miles Davis's famous version (and even more famous album cover). Monk's version is far more stately and far less mournful than Davis's, and it is wonderfully exciting to hear it being interpreted so dramatically differently by the original author. Davis was all darkness and angst while Monk was all wondrous abandon. These two versions present the fundamental difference between the two personalities that made it impossible for them to work together; just like how the sun and the moon are so rarely sharing the same space in the sky, so were these two jazz greats. Even in a melody that lends itself so ably to gloominess, Monk was able to find lightheartedness within. Then there's the take of "Evidence" where Monk is audibly humming along with his own solo like a kid on a sugar-high burning through his energy before lapsing into a sugar coma, or the closing "Bye-Ya/Epistrophy" with Haynes's fierce solo that whips the band into a fervor for the final recitation of the head and quickly transitions into a brief, vertigo-inducing take of "Epistrophy" that whips you around the room like a passing tornado. All of these extras make this a worthwhile purchase on their own merits. 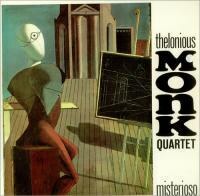 Sure, there are a few better Monk albums (Brilliant Corners and Monk's Music spring to mind) but this is a fine addition and an excellent snapshot of Monk playing in a simple quartet setting, unencumbered by any pressures to break new ground, and able to just let the music and the musicians be. Highly recommended.